You are currently browsing the tag archive for the ‘Farey sequence’ tag. This is a mini investigation based on the current Nrich task Farey Sequences. 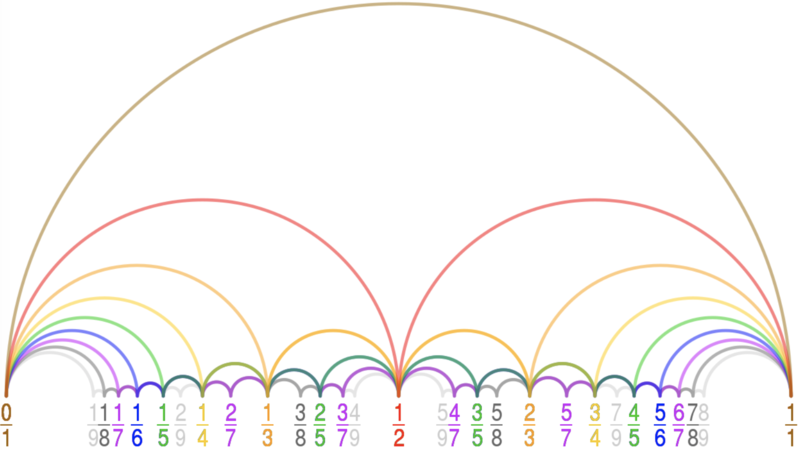 You should be able to notice that the next Farey sequence always contains the previous Farey sequence, so the problem becomes working out which of the new fractions added will not cancel down to something already on the list. Fractions will not cancel down (simplify) if the numerator and denominator have a highest common factor (HCF) of 1. For example 2/4 simplifies because the highest common factor of 2 and 4 is 2. Therefore both top and bottom can be divided by 2. 4/5 does not simplify because the HCF of 4 and 5 is 1. We call 2 numbers which have a HCF of 1 relatively prime. 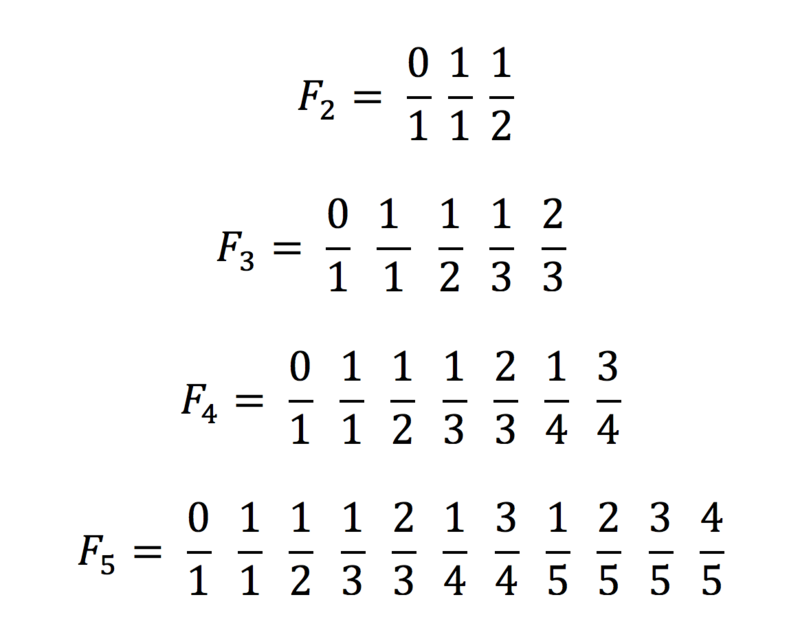 for example for the number 4: 1 and 3 are both relatively prime (HCF of 1 and 4 =1, HCF of 3 and 4 = 1). You might notice that these give the required numerators for any given denominator – i.e when the denominator is 9, we want a numerator of 1,2,4,5,7,8. Euler’s totient function is a really useful function in number theory – which counts the number of relatively prime numbers a given number has. For example from our list we can see that 9 has 6 relatively prime numbers. Euler’s totient function is defined above – it’s not as complicated as it looks! The strange symbol on the right hand side is the product formula – i.e we multiply terms together. It’s easiest to understand with some examples. To find Euler’s totient function we first work out the prime factors of a number. Say we have the number 8. The prime factors of 8 are 23. Therefore the only unique prime factor is 2. Therefore the Euler totient function tells me to simply do 8 (1 – 1/2) = 4. This is how many relatively prime numbers 8 has. Let’s look at another example – this time for the number 10. 10 has the prime factorisation 5 x 2. Therefore it has 2 unique primes, 2 and 5. Therefore the Euler totient function tells me to do 10(1-1/2)(1-1/5) = 4. One more example, this time with the number 30. This has prime factorisation 2 x 3 x 5. This has unique prime factors 2,3,5 so I will do 30(1 -1/2)(1-1/3)(1-1/5) =8. These results compare reasonably well as an estimation to the real answers of 33 and 304,193 respectively.